1. 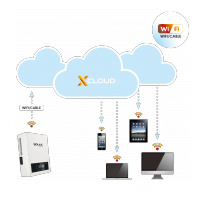 Our Inverters upload operational data to the Xcloud* via WIFI. 2. Xcloud collects and processes that data every 30 seconds. 3. You can then monitor the data by simply logging into a registered account via your PC, iPhone or Android device. 3G Monitoring : NO WIFI @ Home? We Still Have 3G.